The Taliban has had access to portable heat-seeking missiles to shoot at aircraft. A secret US unit of army and navy special forces has been engaged on missions to "capture or kill" top insurgents. Many civilian casualties have gone unreported, both as a result of Taliban roadside bombs and Nato missions that went wrong. The reports offer an unvarnished and grim picture of the Afghan war, she adds. In a statement, US National Security Adviser Gen James Jones said such classified information "could put the lives of Americans and our partners at risk, and threaten our national security". He said the documents covered the period from 2004 to 2009, before President Obama "announced a new strategy with a substantial increase in resources for Afghanistan". Another US official said that Wikileaks - which specialises in making public untraceable material from "whistleblowers" - was not an objective news outlet and described it as an organisation that opposes US policy in Afghanistan. But the head of the Foreign Relations Committee in the US Senate said that "however illegally these documents came to light, they raise serious questions about the reality of America's policy toward Pakistan and Afghanistan". "Those policies are at a critical stage and these documents may very well underscore the stakes and make the calibrations needed to get the policy right more urgent," said Democrat Senator John Kerry. Wikileaks is releasing the set of documents under the title Afghan War Diary. It says is has delayed the release of about 15,000 reports from the archive as part of a "harm minimisation process demanded by our source". The Guardian and the New York Times say they had no contact with the original source of the leak, but spent weeks crosschecking the information. The reports come as Nato says it is investigating reports that as many as 45 civilians died in an air strike in Helmand province on Friday. Although an initial Nato investigation found no evidence, a BBC journalist visiting Regey village spoke to several people who said they had witnessed the incident. They said the attack had come in daylight as dozens sheltered from fighting in nearby Joshani. 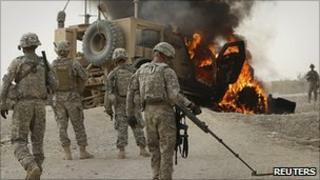 A Nato spokesman said international forces went to great lengths to avoid civilian casualties. "The safety of the Afghan people is very important to the International Security Assistance Forces," Lt Col Chris Hughes added.